It is difficult to summarise A Stranger in Olondria. It is, in some respects, a frame story in which the main plot supports and connects the other stories told by the various characters. But, unlike more famous literary examples, the main story is not a fixed, solid reference for the reader that counterbalances the variety of the minor stories. The plot of A Stranger in Olondria is extraordinarily fluid and keeps changing its shape, sometimes in unexpected ways. It starts telling the youth of the main protagonist, Jevick, and his fascination for a place he has never seen—Olondria: a place that lives in his imagination before being in his senses and memories. His father, a rich pepper merchant, wants Jevick to have an Olondrian tutor, so the boy will became a successful trader, independent from translators and middlemen in his future business. Little does the authoritative and practical man know that the tutor he has hired is teaching Jevick a passion for words instead of the art of commerce. The day comes when Jevick steps onto a ship sailing to Olondria, almost overwhelmed by his own expectations. But you never know what may happen when you leave your house and cross a border. That’s what my grandmother would say a prayer at the beginning of every trip—”You might never come back”, she would say. Or you might be a completely different person when you do. Many unexpected things happen to Jevick after he left his country, and this journey will be longer and more life changing than he would have imagined. Indeed, he will never be the same. He is imprisoned and venerated; writes a poem and invents a new alphabet; speaks with ghosts and finds his love. Of the work of a goldsmith, this book has not only the finesse, but also the care and attention to detail. Words seem chosen with such precision that prose blends into poetry. Unusual terms strike the reader for their almost forgotten expressive power, and common words are sometimes used in less predictable ways, as if the author had given them a new dress that make them look (and sound), at the same time, familiar and surprising. In this book I could find, more or less, everything I love in literature, and echoes of the work of my very favourite writers. Borges’ sophisticated fabrication of worlds, Calvino’s bold and surreal imagination, Potocki’s taste for macabre magic. And, of course, the Arabian Nights and the celebration of the power of stories. But where other authors, even my favourite ones, can become sometimes a bit pleased with themselves, and their ability to forge non existing places and describe them minutely can turn into a sterile exercise of style, Samatar is never arid. She never forgets the human component, that all those made up cultures and languages are someone’s worlds and words. In all its luxurious richness, both in the language and the narration, A Stranger in Olondria manages to never be really excessive. The experience of reading it doesn’t resemble looking at a pompous Baroque church, with polychrome marbles and twisted columns. This book is more Gothic, in the way Karen Blixen described her Seven Gothic Tales: not a literary Gothic, but an architectural one. If you get close, you’ll get lost in all the stories that those countless stone queens and angels and soldiers and monsters can tell you (or let you imagine). 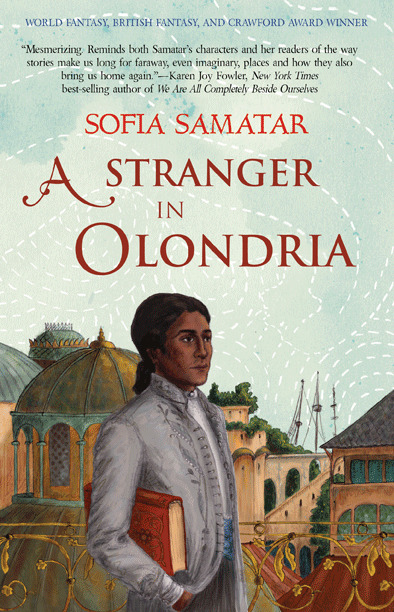 A Stranger in Olondria is not only a brilliant piece of writing, or one of the most moving and intense ghost stories I have ever read (and, for what my judgement is worth, I have read many). It uses speculative worlds to talk about acceptance of diversities; about poverty, illness, disability, ignorance, social justice. About cultural identity and open-mindness. About the need of belonging to a place and a culture and the duty to welcome and understand those who belong to other places and cultures. I have read only praise of A Stranger in Olondria, and I have seen it in many “absolutely to be read” lists of books. Really, there was no need for another enthusiastic review. But, you know, when you fall in love with someone or something you really can’t help telling everyone! You won't be disappointed! Now I want to read everything else she has published!